The Taub Index, based on a series of questions examined in annual Taub Center Social Surveys, approached a record of 66 this year, the highest recorded since the Index was constructed in 2001. This represents a sharp turnaround as three consecutive years of decline were followed by a nearly 17 percent climb. The sense of improvement is shared by the general public. 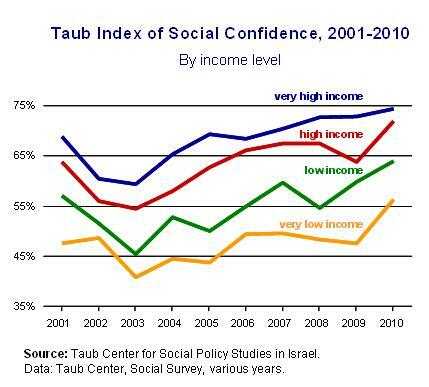 The Taub Index of Social Confidence has tracked the sense of social confidence in Israel for the last decade. The Index, which will be published in its entirety in the forthcoming Taub Center State of the Nation Report, is based on a questionnaire that focuses on changes in standard of living, exposure to violence, basic economic security, and fear of unemployment. The Index score ranges from 0 (the worst) to 100 (the optimal situation). 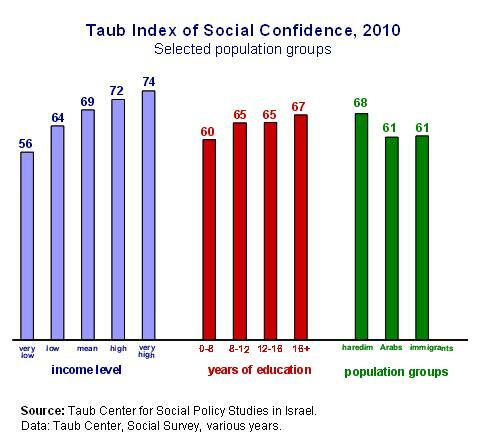 The Taub Index for 2010 climbed to a record level of 65.6 points, more than 9 points higher than last year’s level and higher than any other year that the Index has been examined (see figure). 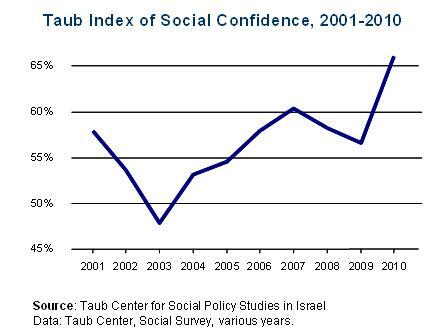 The Taub Index has been in an overall upward trend since 2003, but the global crisis of 2008 and 2009 was accompanied by a decline in the feeling of confidence. As the sense of emergence from the crisis strengthened, a large jump appeared in 2010 that restored the Index to the same long-run path that it has been on since 2003. Dividing the population by income level shows clear differences between groups but, on the whole, the trends of the Index remained similar across all groups. On the one hand, the overall pattern of the index displays a distinct hierarchy in the level of social confidence and shows the existence of persistent gaps in the feeling of social confidence (see figure below). On the other hand, the distance between the various trend lines is quite stable, and the improvement since 2003 is common to all groups. The most moderate increase occurred among individuals with the highest incomes, although their Index score remains the highest of all and this year reached a record 74.4 points compared to 72.6 in 2009. The Index score of the second highest group, those with incomes somewhat above the average, drew closer to that of the highest incomes, rising to 72 points. This compares with 61 points the previous year and reflects an increase of 18 percent. These findings suggest that the phenomenon of the “disappearing middle class,” which has drawn much attention in the media, was not expressed last year in public opinion. The Index score of those with incomes “far below average” rose notably, to 56 points, after several years of stagnation at the level of 47-49 points. This year’s level is the highest recorded for this group, and the gap between it and that of those with the highest incomes declined since 2009, from 25 to 18 points. Differences in education do not appear to be reflected in the same social confidence gaps as differences in income (see figure). This finding is consistent over time. The Index score for the college-educated in 2010 is the highest recorded so far (67 points) while the score for those with a non-academic post-secondary and secondary education is 65 points. Individuals with lower levels of education reported a social confidence level of 60 points. Despite a substantial rise, the Index for the Arab Israelis stands at 61 points, roughly at the same level as the lowest education group and at the level of the two lowest income groups. The concerns among the Arab Israeli population are especially noticeable in response to survey questions regarding their standard of living: the number of respondents expressing difficulty in meeting basic living needs is especially high among the Arab Israelis where almost half said they experienced such difficulty (46%). Amongst this population, the concern of even greater economic problems was particularly high: 19 percent of Arab Israelis versus 10 percent of Jews expressed a great deal of concern and 22 percent versus 16 percent respectively expressed some concern. What is more, 15 percent of Arab Israelis versus 6 percent of Jews felt that their situation was likely to worsen over the coming year. The Index score for ultra-Orthodox Jews, or haredim, rose to 68 points, higher than in previous years and also higher than the national average. These findings are particularly interesting in light of the fact that haredim are in general considered to be among the weaker socioeconomic population groups. Nevertheless, in the Taub Center Social Survey haredim do not report that they have difficulty affording basic living needs and do not feel that their situation has worsened over the past years. Their concern of a decline in their economic situation is relatively low and they express a greater optimism than other groups in society that their situation will, in fact, improve. Since the Social Survey is meant to tap into subjective feelings, it could well be that certain groups in society define basic living needs differently or assign less importance to the variables examined. It is also possible that the haredipopulation, in particular, have other means of income – whether from work or alternate sources – that influence their sense of socioeconomic confidence. Immigrants from the former Soviet Union (FSU) are characterized by a low social confidence score – 61 points – equal to the level found among Israeli Arabs. This score also represents an increase from previous years although it is considerably lower than the average. Immigrants express feelings that their standard of living is not sufficiently high and is unsatisfactory (the rate of those reporting economic difficulties is relatively high) and they do not feel optimistic about the future.